Hercule Gibbs Morgan is a sorcerer. Evil doesn’t begin to describe him. He uses the blood of the innocent to keep himself young. It is his desire to harness great power and rid the world of the plague of inhabitants—humans. To do this, he needs a werewolf because no other being has the necessary power in its blood. Frank Burkhard is a werewolf. His family has lived with this secret for generations. Cursed for the deeds of an ancestor, Frank has just experienced his first transformation. When he escapes from the stronghold of his parents’ home, his family is kidnapped. It’s up to Frank to find and rescue them, but he can’t do it alone. He and his parents must complete a quest to break Frank’s curse. Petra Card is a vampire. She’s stalked the night since the 1920’s. Coming across Frank in a nightclub, she finds a source of energy that assuages her hunger far longer than a mere human’s. For that reason, and the dreams she’s having, she decides to follow Frank and help him where she can. Two organizations exist to keep the world safe from supernatural trouble, The Secret Compass and The Rising Sun Group. Helen Kiln works for The Secret Compass. She uses her psychic abilities to find vampires, werewolves, etc. In a vision, she is warned that Frank Burkhard needs her help. Since he hasn’t killed humans or done anything evil, she agrees to help him. Danny Broom and Mike Evans are Secret Compass agents sent to aid Frank and his parents in their quest. 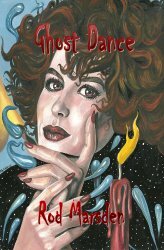 Ghost Dance is an interesting blend of fantasy, action and mystery. I found myself caught up in the tale as it blazed through Australia, England, France, Italy and Germany. Ghost Dance explores the question: If the world faced a great enough evil, who would protect us? Author Rod Masden answers that question well. I recommend Ghost Dance to anyone who likes a good action story, a cunning mystery or lives to gobble up any story with werewolves and vampires. **Warning** These vampires don’t sparkle. 300 years ago, vampires scourged the countryside, eradicating witches. Total annihilation was the goal, total genocide of the entire race of witches – and they were almost successful. Only the Seer of the Witches was able to elude them long enough to save her daughter, casting her into time. There, she was safe, born again in the future, not even knowing exactly who she is. In the present, Ross and Liza Preston are driving home after being told by a fertility clinic that they will never have a child. Devastated by the news, they hardly expect to find a child abandoned in the wilderness. Seeing it as a sign, they take her home and adopt her, naming her Aradia. The story moves ahead about 14 years and Aradia is starting high school. Her dad’s career change has necessitated a move from Arizona to Salem, Massachusetts. As an assistant district attorney, he’s been given his first big case, the Vampire Murderer, as the press has dubbed the mysterious killer who drained his victim of blood. In a whole new school, Aradia faces her first day with trepidation. Fortunately, she makes friends with some other seeming outcast students, Rhonda, Felix, Everett and Calvin. She also meets a young man in PE named Roy and shows a little of what she can do by racing him on the track. During the day, Aradia notices some of the other teenagers are too good looking for words. Roy is almost in this category, but Tristan and Dax are the two best looking guys in school. Aradia dubs them ‘too good to be true’. Little does Aradia know, but much is afoot. The so called Vampire Murder may have been committed by an actual vampire! There is far more to Salem than meets the eyes and Aradia is about to get in over her head. Against her parents’ wishes, she investigates the murders, searching for the killer. What she finds is even more astounding than she anticipated. Tales of Aradia: The Last Witch, volume 1, is extremely well paced, building steadily to the climax. The characters are believable, even though they are, for the most part, not human. Having it set in Salem is fun. According to the story, it’s a hot spot for paranormal creatures (or hiddens) to dwell. This is a wonderful book young adults and older adults as well. The language isn’t objectionable and there are no sexual scenes. It would make a great read for anyone 12 and up. I highly recommend Tales of Aradia: The Last Witch, volume 1 and look forward to reading more about this plucky teenaged heroine.